※Please come join us for traditional worship music, prayer, readings from the Bible, preaching, and etc. We also have children class during the service. ※This is mainly for those who are not familiar with church. With new christian music, simple and comprehensible talk from the Bible will be provided. Please come and join us. ※Every Thursday we basically have two prayer meetings. One is from 10:30 am. The other is from 8:00 pm. Please contact our church for more information. From 1 pm to 3 pm every 1st and 3rd Sunday at church we hold kids gathering. On April 21, Easter special for Kids(Egg hunt game, etc. )will be held. Please come and join us. Parents are welcome! For Nozomi club blog (in Japanese), click here. Ikebana class will be held every 1st(at Kasumigaseki-Kaikan from 10 am) and 3rd(at Nozomi Church from 2 pm) Thursday. 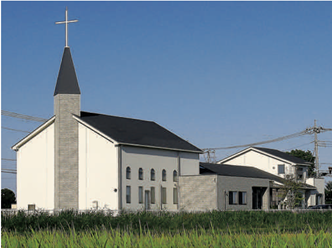 Please contact Kawagoe Nozomi Church for more information. Ikebana class blog(in Japanese), click here. 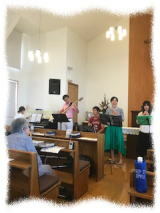 Every 3rd Sunday from 1:00 pm to 2:30 pm Kokorono Fureai cafe is held at church. For more infomation, please contact kawagoe Nozomi Church. For Kokorono Fureai cafe blog(in Japanese), click here. Every 4th Thurdsday from 2 pm to 5 pm, Nozomi cafe for Cancer patients and their family members. We talk with them over a cup of coffee. Anyone who would like to share their feelings with them is welcome to join us. Please contact Kawagoe Nozomi Church. For Nozomi cafe blog(in Japanese), click here. 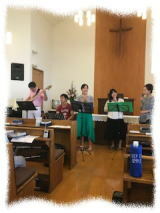 ◇Every 2nd Sunday morning services, a youth bright worship is conducted. Please don't miss it. ◇ Here is Kawagoe Nozomi church brochure.